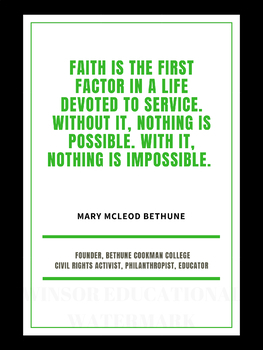 Powerful inspirational poster quote by Mary McLeod Bethune, a great African American educator. She was the founder of Bethune Cookman University, an advocate for education and a civil rights activist. The quote states: "FAITH IS THE FIRST FACTOR IN A LIFE DEVOTED TO SERVICE. WITHOUT IT, NOTHING IS POSSIBLE. WITH IT, NOTHING IS IMPOSSIBLE." This print is great to encourage, to use in your office, home, classrooms, home schools and for Black History Month or Women's History month displays and celebrations. Poster measures 18 by 24 inches. The watermark on the picture will disappear once you purchase and download begins.